A 5-year-old restaurant and bar in the Fan has come back to life following a summertime shutdown and nearly $500,000 in renovations. Social 52 at 2619 W. Main St. had a soft opening Sept. 12; it’s been closed since June 4. With the business well-established, the company decided a more substantial remodel of the location was the first step in establishing a brand as it considers expanding to other areas of the state. Sanie said they’ve scouted spots in Richmond’s Southside and Williamsburg. Changes to the space included a realignment of the restaurant’s interior layout. Previously, due to the location of the entrance, customers had to walk through the dining space to access the bar. The architect for the project was Bob Steele and his wife Robin was the designer. B & L served as the contractor. The previous layout also hid the bar from street view. That’s changed now that it’s on the opposite side of the building. 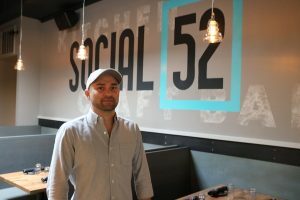 Social 52’s menu also is getting a makeover as it looks to focus on brunch and lunch, along with happy hour and dinner. It already had an established late-night crowd. Sam Schleicher is the new chef. “He’s going to be the future of where we take Social in the next couple of years,” Sanie said. The bar has expanded from 18 to 24 taps, four of which are cocktails. The current on-tap cocktails are lemon drops, Manhattans, a hard seltzer and Moscow mule. 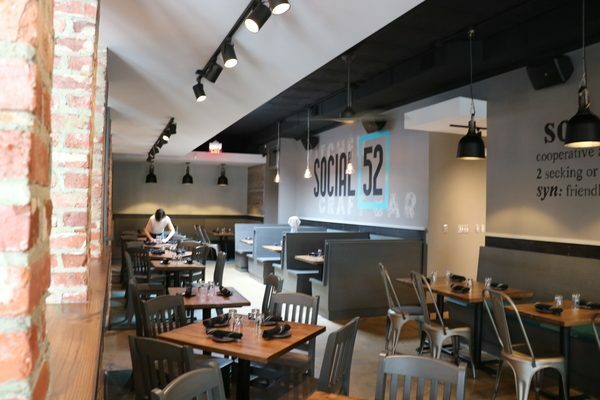 Social 52’s logo and signage also has been updated, in conjunction with an exterior paint job. An artist by the name of Analogy LLC was chosen to design the new logo. Sanie said the business was able to retain much of its previous staff despite the three-month closure. And he hopes previous patrons will return to check out the new look. “I hope that our previous guests will come back and be wowed by the changes, and I hope that we’re able to capture some new guests as well,” he said. 1 Comment on "Fan restaurant reopens after three-month remodel"
The old layout felt disjointed and they’ve done a great job with their renovation. I’ve been once for happy hour and once for dinner since the reopening. I also agree the menu revamp has gone well. My only suggestion is they need to invest in sound dampening, because nearly all surfaces inside are hard. It becomes extremely loud, which ideal for dinner time.